Precious Pages by Paula: CYAO OF THE WEEK! 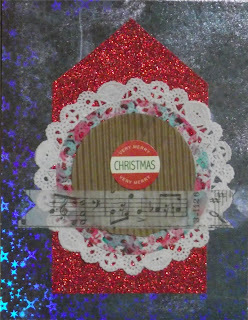 I started by putting a layer of silver patterned paper, then I cut some red glitter paper in the shape of a tag. I topped that off with a doily, a piece of transparency stained with alcohol inks, a circle of corrugated, a strip of washi tape and a sentiment.